"Evil finds its way home"
Halloween: Resurrection (2002) is the eighth and final installment in the original Halloween franchise that started with the 1978 original. Directed by Rick Rosenthal - who directed the first 1981 sequel - this movie picks up where Halloween H20: 20 Years Later left off in 1998. Taking place in Michael Myers' hometown of Haddonfield, this film was meant to be a resolution to the long-running film series. As the film opens, we find out that Laurie Strode (Jamie Lee Curtis) didn't decapitate her brother, as depicted at the end of the previous film. Instead, she had beheaded a paramedic Myers attacked and dressed as himself after crushing his larynx to keep him from making a sound. Laurie is now in a psychiatric hospital where, as Halloween night approaches, she feigns taking her medicine and prepares to confront Michael. Meanwhile, we see that Michael is once again trying to find and kill his sister. Laurie sets a trap for Myers, but wants to make sure it's him before stabbing him. Myers take advantage of this moment of weakness and stabs her in the back. After declaring "I'll see you in hell," Laurie falls to her death. We flash forward to the next Halloween where a group of college students - including Tyra Banks and Busta Rhymes - are preparing to participate in an Internet reality show at Myers' old home. Their goal is to discover what set Michael off on his killing spree, which ignores explanations given in earlier installments of the series. On Halloween, the students search the house for clues to Michael's past. They break up in smaller groups to cover more ground. Michael marks his return to his childhood him by killing the cameraman with his tripod. Soon, the deaths start to pile up. In a nod to the original, one student is pinned to a door and killed. Another is strangled with a cord. One is decapitated and a few are killed off camera. Those watching on the Internet assume that the deaths they are watching are being staged. Soon the survivors realize that something is wrong. Those viewing the broadcast while having a Halloween party also slowly come to the same conclusion. In continuing with the Halloween tradition, a few of the students manage to survive as Michael continues his rampage. The survivors set the house on fire, making the assumption that this will finally kill Michael. The film wraps up with an ending that's not all that surprising for any Halloween fan. 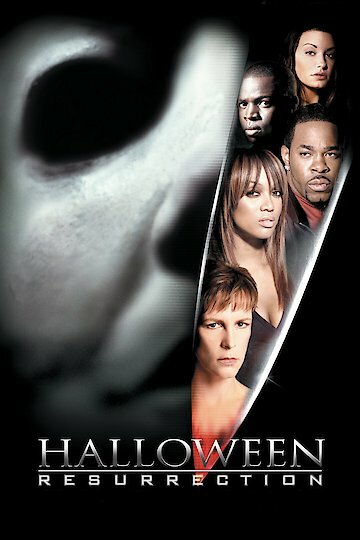 Halloween: Resurrection is currently available to watch and stream, buy on demand at Amazon, Vudu, Google Play, FandangoNow, iTunes, YouTube VOD online.